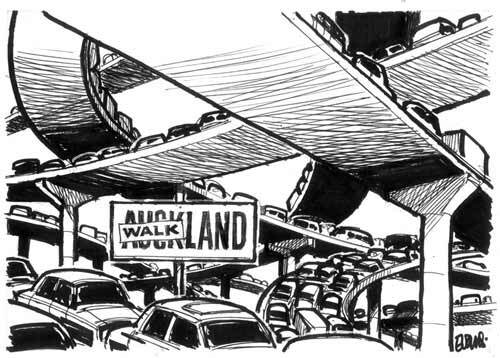 In the 1950s Auckland decided to solve its growing traffic problem by building motorways at the expense of public transport. The policy encouraged greater car use, leading to more congestion and more new motorways. Cartoonist Malcolm Evans satirised the policy in this 2003 cartoon. Since the early 2000s transport authorities have encouraged the use of public transport by introducing bus lanes on crowded roads, and running a more reliable suburban rail service.